super funny comic. . Wallpaper and background images in the सॉनिक और एमी club tagged: sonic amy sonamy love funny. This सॉनिक और एमी photo might contain रंगीन काँच, सना हुआ ग्लास विंडो, मोबाइल फोनों के लिए, हास्य पुस्तक, मंगा, कार्टून, एनीमे, कॉमिक बुक, and manga. 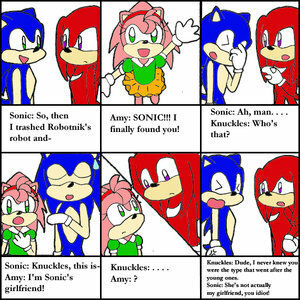 thats hilarious and knuckles thought sonic was a type to go with the young ones like amy. HEY I AM SONIC'S GRIL-FRIEND!! !